What an evening it has been!! 26 terrific acts sang their hearts out on stage, competing for the ultimate prize; the title of winner of the 2017 Eurovision Song Contest. However, in the end there could be just one winner and that was Portugal's Salvador Sobral. As was just revealed, Portugal also won the first Semi-Final on Tuesday. Many fans at the venue were brought to tears as Salvador was joined on stage by his sister Luísa, who also wrote and composed Amar Pelos Dois, when performing the reprise of their winning song. Luísa covered for her brother during many of the rehearsals, as Salvador himself could not be present in Kyiv for the full two weeks due to health issues. Portugal was followed by Bulgaria's Kristian Kostov, who won the second Semi-Final. 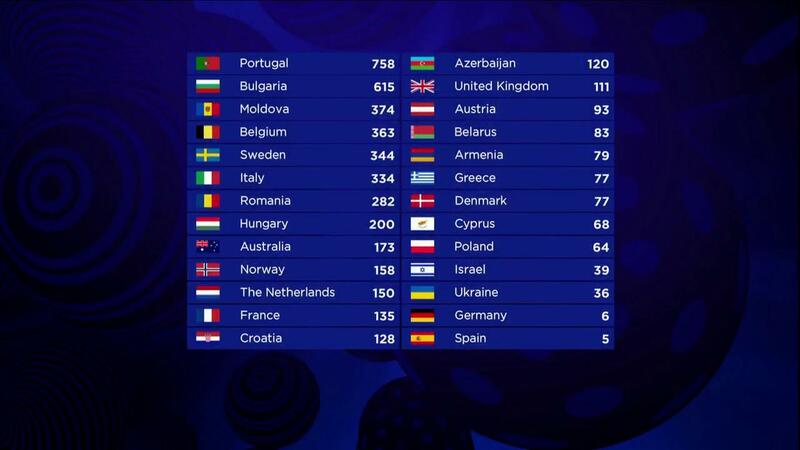 Moldova came third with 374 points, at quite a distance from the winner and the runner-up. Last year's host Sweden finished 5th, closely behind Belgium, which came 4th. Spain came last with 5 points, followed closely by Germany with only 6 points. Host country Ukraine came third-last with 36 points. Italy, which was widely tipped as potential winner by press, fans and bookmakers, eventually finished 6th. Jon Ola Sand, Executive Supervisor of the Eurovision Song Contest, congratulated Salvador and Luísa, Portuguese broadcaster RTP and the Portuguese people with their first ever Eurovision Song Contest victory on behalf of the European Broadcasting Union. Salvador Sobral venceu o Festival Eurovisão da Canção, the website of broadcaster RTP headlined. Portugal participated in the Eurovision Song Contest for the first time in 1964, represented by Antonio Calvario with the song Oração. The closest Portugal ever came to winning the contest was in 1996, when Lúcia Moniz finished 6th. The final outcome was decided by a 50:50 split between professional juries and televoting from all 42 participants. The jury votes were decided during the Jury Final on Friday night, the televotes were decided during the actual live show. The 26 finalists were made up of 20 qualifiers from the first and second Semi-Finals held on the 9th and 11th of May, and six automatic qualifiers including the so-called 'Big Five' countries — France, Germany, Italy, Spain and the United Kingdom — and host country Ukraine. Thousands enjoyed three spectacular live shows at Kyiv's International Exhibition Centre this week, with an expected 200 million viewers tuning in on television. On YouTube, the Grand Final was watched by some 4 million people, breaking records. It was the second time Ukraine hosted the contest, the first time was in 2005, also in Kyiv.